Join us for a Kaleidoscope of Yoga at Sunburst located off of HWY 1 near Lompoc, CA. You will begin your yoga journey and unwind with a restorative yoga class taught by Lori Anderson Friday evening after a light dinner. Start your Saturday morning off with Tommy Anderson as he introduces his Vraaja Yoga™ method with a class instructing you how to use micro movements to achieve poses you never thought possible. After breakfast Kundalini yogini Nam Khalsa will guide you through a practice of yoga, breathing techniques, mantra, music and meditation. 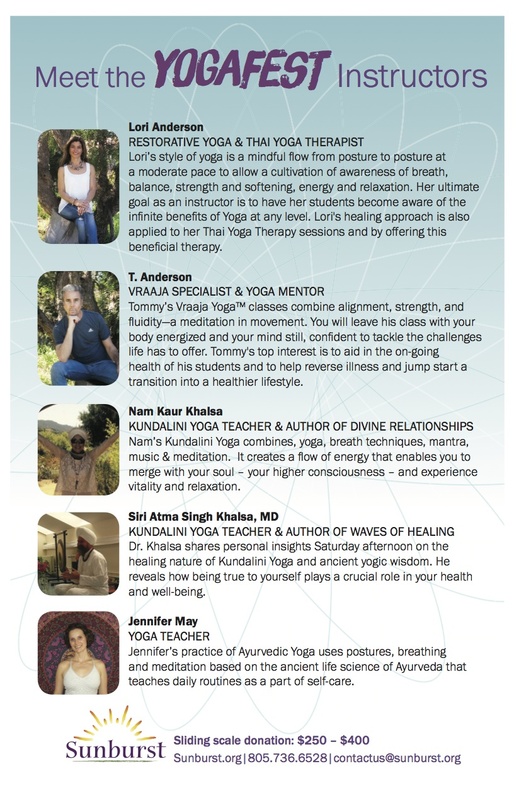 After lunch join Dr. Siri Atma Khalsa for a lecture as he shares personal insights on the healing nature of Kundalini yoga. After dinner Lori Anderson will guide you through a partnered, relaxing Thai Yoga Therapy session. Sunday morning Jennifer May will take you through an Ayervedic yoga practice to nourish the doshas. The Sunburst family will close out the weekend with their Sunday service which includes music, an inspirational talk, quiet time for prayer and meditation and brunch. WorkshopsLori Anderson October 2, 2017 yoga, arm balance, yoga workshop, arm balance workshop, bakasana.